Different from other pet birds, peafowl require special accommodations for their needs, habits and peculiarities. Pheasants, peacocks hail from Malaysia and South Asia; they were first kept as pets by the Chinese and Europeans. 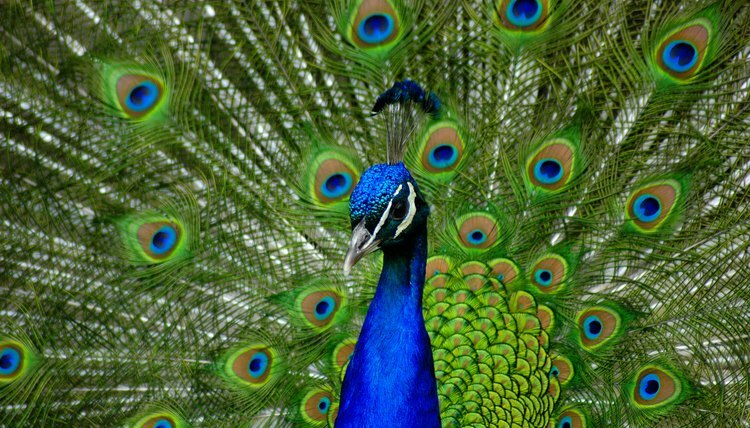 Only peacocks -- male peafowl -- have the notably large and iridescent plumage with vibrant hues. Peacocks are boisterous and often aggressively territorial, two facts you must carefully weight prior to acquiring them as pets. Some localities do not allow peacocks, so check your local zoning regulations. Find a reputable source before selecting a peachick, preferably a source where you are allowed to visit the birds in their housing. Indian Blue, Black Shoulder and Java Green peafowl are popular as pets, with the latter being the least vocal. Best suited to rural areas, peafowl are free-roaming birds; they require room to range. They are kept as yard birds, free to roam within their territory. Peafowl can fly, so their wings must be clipped regularly. Peafowl prefer to live in areas with access to low trees and plants for food and shade. Peafowl thrive best in warmer climes. Today, people keep and breed peafowl for profit and for hobby. Some pet peacocks live in backyards, while others are offered spacious farmlike surroundings. Peafowl need a place to roost at night, filled with sticks and straw. Most shelters for peafowl are simple four-sided structures, with a roof and raised platforms for resting. Peafowl should not be kept with other domestic yard birds such as chickens and turkeys. Peacocks -- just the males -- are famous for their screeching calls. The extent of a specimen's courtship callings depends on the peacock's age and species, the time of year, the number of peahens nearby and localized ambient noise. Mating season, the time when they come into voice, starts between August and September; peacocks "break" from voice around December or January. If you want your peafowl to reproduce, keep one male and no fewer than three unrelated peahens. Once inseminated, females will lay three to five eggs in 21 to 28 days. Peafowl are omnivorous; they feed on flesh and vegetative fare. Grain is their staple, but their diet includes fruits, seeds, plants, insects, fish, small reptiles and amphibians. Some peafowl owners cultivate seeds, greens, carrots and alfalfa for their birds. Make sure your peafowl have fresh water at all times. Peafowl are hardy birds, with life spans of 15 to 25 years. Peafowl are subject to diseases including botulism, cholera, avian tuberculosis, crooked toe, Newcastle disease and eye infections. Check your peafowl regularly for worms.